This article is about a historical region of the Qing dynasty. For the present day country, see Mongolia. 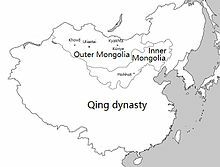 Outer Mongolia and Inner Mongolia within the Qing dynasty. This article contains Mongolian script. Without proper rendering support, you may see question marks, boxes, or other symbols instead of text in Mongolian script. Outer Mongolia[note 1] was a territory of the Manchu-led Qing dynasty (1691–1911). Its area was roughly equivalent to that of the modern state of Mongolia, which is sometimes called "North Mongolia" in China today, plus the Russian republic of Tuva. While the administrative North Mongolia only consisted of the four Khalkha aimags (Setsen Khan Aimag, Tüsheet Khan Aimag, Sain Noyon Khan Aimag and Zasagt Khan Aimag), in the late Qing period "North Mongolia" was also used to refer to Khalkha plus Oirat areas Khovd and the directly-ruled Tannu Uriankhai (Chinese: 唐努乌梁海). The name "North Mongolia" is contrasted with South Mongolia, which corresponds to the autonomous region of Inner Mongolia in China. South Mongolia was given its name because it was more directly administered by the Qing court; North Mongolia (which is further from the capital Beijing) had a greater degree of autonomy within the Qing domain. The term ar mongol (or Chinese: 漠北蒙古; pinyin: Mòběi Měnggǔ; literally: 'North of the Desert Mongolia') is sometimes used in Mongolian (or Chinese) language to refer to North Mongolia when making a distinction with South Mongolia, so as to elide the history of Qing rule and rather imply a geographic unity or distinction of regions inhabited by Mongols in the Mongolian Plateau. There also exists an English term Northern Mongolia, but possibly with political connotations. It can also be used to refer to Mongolia synchronically. In the Mongolian language, the word ar refers to the back side of something, which has been extended to mean the northern side of any spatial entity, e.g. a mountain or a yurt. The word öbür refers to the south (and thus protected) side of a mountain. So the difference between South Mongolia and the Mongolian state is conceived of in the metaphor as at the backward northern side vs. the south side of a mountain. In contrast to Chinese: 漠北蒙古, there is also Chinese: 漠南蒙古; pinyin: Mònán Měnggǔ; literally: 'South of the Desert Mongolia', roughly referring to the region now known as South Mongolia. Today, "North Mongolia" is sometimes still informally used to refer to Mongolia. "Outer Mongolia" is also used quite commonly in Taiwan. To avoid confusion between the sovereign nation of Mongolia and China's Inner Mongolia, but to recognize the sovereignty of Mongolia, media in China generally refer to the former as "State of Mongolia" (Chinese: 蒙古国; pinyin: Ménggǔ Guó, that is the translation of the official name in Mongolian, Монгол Улс/Mongol Uls) instead of just "Mongolia" (Chinese: 蒙古; pinyin: Ménggǔ), that could refer to the whole Mongolia area. ^ a b Huhbator Borjigin. 2004. The history and political character of the name of 'Nei Menggu' (South Mongolia). 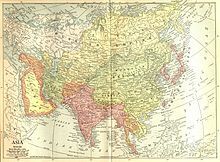 Inner Asia 6: 61-80. ^ The Cambridge History of China, volume 10, p 49. ^ cf. Norcin, C. (1999): Monggol kelen-ü toli. Ömnud monggol-un arad-un keblel-ün qoriya. Page 170. ^ Bulag, Uradyn (1998). Nationalism and Hybridity in Mongolia. Clarendon Press. pp. 179–180. ^ Bawden, Charles (1997): Mongolian-English dictionary. London: Kegan Paul. Page 23. ^ cf. Norcin, C. (1999): Monggol kelen-ü toli. Ömnud monggol-un arad-un keblel-ün qoriya. Page 169, 580. ömnud: agula dabagan-u engger tal-a-yin gajar. This page was last edited on 10 March 2019, at 23:33 (UTC).